Driven by their online buying experiences, savvy business to business (B2B) buyers are demanding omni-channel capabilities when making work-related purchases. In August 2014, Accenture and hybris software, an SAP company, commissioned a study by Forrester Consulting to explore how B2B buyer expectations are transforming how suppliers sell and deliver products and services. 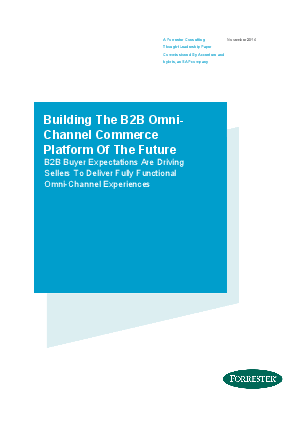 • High customer expectations have led B2B firms to shift toward rich omni-channel experiences. • Providing a comprehensive omni-channel experience helps ensure customer loyalty. • Merchants will fall behind if they fail to adapt their technology to buyer needs. • Technology investment must be aligned with organizational and process change.